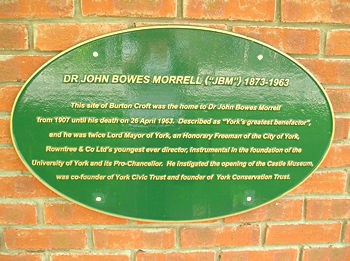 Burton Croft, former home of J B Morrell, was visited in York Walks /3, in the summer of 2004, when its future was being debated. 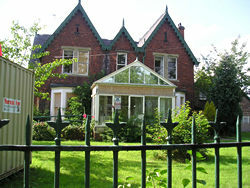 A planning application by Barratt Homes would involve demolishing the Victorian house and building flats in its place. The plans were controversial, and many local people tried to save the building. The developers won. In the summer of 2004 the house was looking a little run-down, with some of its windows boarded up, and holes in the roof. A security guard could often be seen sitting in the conservatory looking a little bored. The house was a nursing home for the elderly in recent years, and I remember, from passing sometimes, residents sitting in this conservatory, with its view of the garden. The nursing home closed some years ago, as so many have. By November, when this photo was taken, Barratt had got its way. 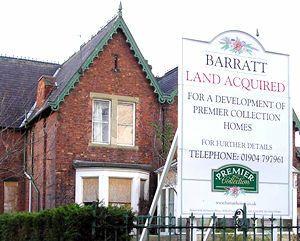 I wasn’t feeling particularly anti-property-developer at the time, until I saw this Barratt sign. I realise that it’s a standard sign, but it might be more appropriate next to an empty field. You can’t help but notice that the ‘LAND ACQUIRED’ referred to has a large house in the middle of it. But it’s just land to them. 5 February 2005 – and the house is no longer inconveniently getting in the way of the glorious future of this piece of land as a site for ‘Premier collection homes’. This view is taken from the same corner as the image above, with Burton Croft now a pile of bricks in the background. I didn’t campaign about Burton Croft, and I didn’t feel as strongly about its fate as many people did. 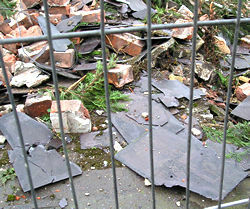 But when I heard it was being demolished, I couldn’t bring myself to go and look, and take photos of the actual demolition, though perhaps the photos would have been more interesting than this one, of a pile of slates and bricks. There’s something sad always about buildings being demolished. Many people had fond memories of this building, and admiration and respect for the work of J B Morrell, whose home it originally was. 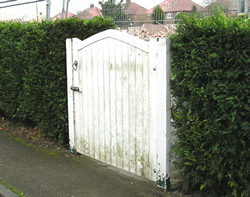 To the side of the demolition site, this old garden hedge and its white gate remained, rather incongruous and a little sad somehow. But sentiment aside, we may want to question the sheer waste involved in destroying a solidly-built house. And we can’t help but think about the environmental impact of destroying it – removing tons of bricks and broken slates and smashed window frames – and then bringing onto the site all the materials needed to build a lot of new houses in its place. Still, they’re property developers, and that’s what property developers do. 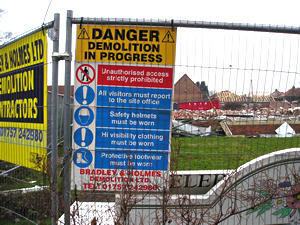 Now, in the summer of 2005, the site is surrounded by hoardings and there’s a marketing place at the front. 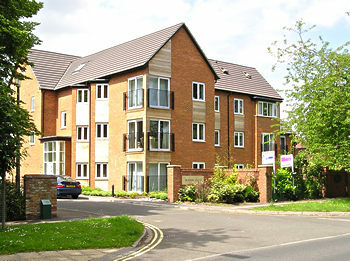 The new development on the site of Burton Croft is pictured below. On the wall forming the boundary to the street is a plaque, also pictured. I wonder if anyone else reading this plaque would find it sadly ironic that the house of the founder of York Conservation Trust wasn’t conserved. It also seems a shame that the phrasing of this sign is rather clumsy. But maybe now I’m just being picky and pedantic (and I’m sure there’s some clumsy sentences on here). Have to say that the flats look quite handsome, as modern flats go, and fit in okay, in my humble opinion. Since I wrote the above update, the metal plaque has disappeared. Perhaps another case of metal theft – an increasing problem. My grandmother Maud Mary Dodsworth Brain worked as head housemaid at Burton Croft for Mr. Morrell. In the late fifties when i was eight years old,i had the good fortune to stay at the house during the summer holidays on three or four ocasions,My uncle clifford was the chef chauffer and my aunt was the housekeeper. what happy memories i have of the house and lord morell,he was a very kind man who always took an interest in what i had been doing that particular day and as a treat he used to take me in the car to view the different city gates to compare his painting of them and ask me my opinion, i think he was very proud of these. this i found very interesting even at that age. i try now in my later years to visualise the inside of the house and its contents,i remember the entrance hall and grand staircase leading up to Lord Morells study and on his desk a bust of him.i remember all the fine paintings, clocks and porcelain, one day i was playing pitch and put and i accidently broke one of the hichory putters,i was very distraught and worried so i went to tell my uncle what i had done,he took me to tell Lord morell in his study, i was shaking when i went in ,and said i was sorry,he replied,dont worry master johnathan (that was the only time in life i had been called that) i have plenty more and i never use them anyway but thankyou for telling me. whilst the house is sadly gone i would love to see pictures of the house inside with its contents. When Lord Morell passed away my uncle was left by him a waterside apartment,to live in as long as he wished. These are wonderful memories John, thank you for adding them to this old page of mine – can’t believe it’s 12 years since I wrote it. – there’s an email address for them on the ‘Contact’ page. Hello Lisa thank you for your information and prompt reply. I’m just reading “Three Generations” by Ann Vernon. It contains a lot about Burton Croft. Lisa. Would you like to tell my meeting on March 12th about your project? I could give you a five minute slot if you are interested. I like the bit in Ann Vernon’s book where it says that loads of people can speak for half an hour but it takes a real expert like J B Morrell (or you) to speak for five minutes. Thanks John, I’ll have a look for the book you mention – local library might have it? I can’t make the event you mention, but thanks for your kind words.